If you were to ask me my political affiliation, I would most likely respond, "Leave me alone and I'll do the same for you." Seriously, I am SO not into politics. I tend to vote on a issue-by-issue basis and find it much more interesting to spend time talking about "caddy" pop-culture topics than political issues that, truly, I know nothing about in the first place. Call it ignorance, but I prefer my bliss. That said, our current First Lady is doing a great job getting me to talk about politics - finally - with her latest fashion decisions (I see a series of Fashionably Friday entries just showcasing her jewelry choices in our future!) I am going to let you all do the talking here as I merely, in a very Christyn style, present the topic and listen to what others have to say rather than soiling the issue with my uneducated opinion. Don't get me wrong, I have PLENTY of things to say about these fashion/political choices, I just choose to plead the 5th :) Let the debate COMMENCE! Don't forget to swing by my boutique shows this weekend - all of Bead Up's jewelry will be on display and for sale! I even hear they are going to have a snow slide at the show in Redondo Beach - I'm there! Those earrings are amazing. I really love the style of that first necklace, too. Hmmm, I'm feeling inspired. It's so nice to have a fashionable first lady. I love the necklaces by Loree Rodkin!!! As for the earrings that she wore to the State dinner with the President of India, if her dress was pure politics, then while I understand the colors used in the earrings, why is it topped with fleur de lis?? Or is that simply more politics happening within politics?! Very interesting post! Now I'm curious how your shows went over the weekend! Do tell! I must admit that I am the same when it comes to politics; but my husband follows all that is going on, as do my parents and brother. I wonder what happened with me? 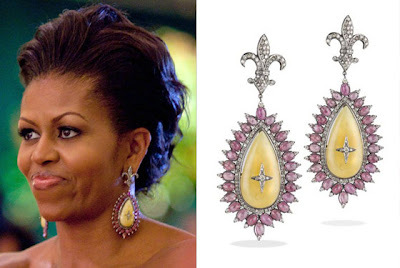 Anyway, the First Lady really does have fabulous taste in jewelry, I must say. I am a huge fan of big gaudy jewelry, but I will admit that the third necklace, by Tom Binns, is a bit much. It looks like a scarf! That is the style right now. Living in New York City, I see all different types of styles, and the First Lady is definitely hip and trendy. It must be nice to take advantage of your position and wear expensive jewelry on loan! I don't personally see anything wrong with it, especially if she's helping to support hand-crafters. Two Boutique Showings in less than 30-hours!